There's some serious history behind this famous but widely misunderstood slogan, coined originally (I think) by Hero of Alexandria. Before Pascal and Descartes (and Boyle and Hobbes and a cast of thousands), there was Hero's footnote to Aristotle's "plenism". Aristotle denied the void can explain why things move. Movement requires a mover that is pushing or pulling the object. An object in a vacuum is not in contact with anything else. If the object did move, there would be nothing to impede its motion. Therefore, any motion in a vacuum would be at an unlimited speed. Aristotle's refutation of the void persuaded most commentators for the next 1500 years. There were two limited dissenters to his thesis that vacuums are impossible. The Stoics agreed that terrestrial vacuums are impossible but believed there must be a void surrounding the cosmos. Hero of Alexandria agreed that there are no naturally occurring vacuums but believed that they can be formed artificially. He cites pumps and siphons as evidence that voids can be created. Hero believed that bodies have a natural horror of vacuums and struggle to prevent their formation. You can feel the antipathy by trying to open a bellows that has had its air hole plugged. Try as you might, you cannot separate the sides. However, unlike Aristotle, Hero thought that if you and the bellows were tremendously strong, you could separate the sides and create a vacuum. … scholars writing in the aftermath of the condemnation of 1277 proposed various recipes for creating vacuums. One scheme was to freeze a sphere filled with water. After the water contracted into ice, a vacuum would form at the top. Aristotelians replied that the sphere would bend at its weakest point. When the vacuists stipulated that the sphere was perfect, the rejoinder was that this would simply prevent the water from turning into ice. Hero was eventually refuted by experiments with barometers conducted by Evangelista Torricelli and Blaise Pascal. Their barometer consisted of a tube partially submerged, upside down in a bowl of mercury. What keeps the mercury suspended in the tube? Is there an unnatural vacuum that causes the surrounding glass to pull the liquid up? Or is there no vacuum at all but rather some rarefied and invisible matter in the “empty space”? Pascal answered that there really was nothing holding up the mercury. The mercury rises and falls due to variations in the weight of the atmosphere. The mercury is being pushed up the tube, not pulled up by anything. When Pascal offered this explanation to the plenist Descartes, Descartes wrote Christian Huygens that Pascal had too much vacuum in his head. Descartes identified bodies with extension and so had no room for vacuums. Nature will suffer a vacuitie. Plot: How like you this, Mr. Pedagog , have I not taught your Pupil rarely this Morning? Anthony: Prethee let me have my full swinge at him (for he has had his many a dismal time at me:) I say, if thou dost not conform to all the Maxims of Jack Plot, Tom Art , and my own dear self, I will peach thee at such a rate to my Sire, as shall provoke him to uncase thee out of thy Pedagogical Cassock, Condemn to the Flame, Martyrlike all thy Ferula's, Grammars, Dictionaries, Classick Authors, and Common-Place Books; nay, take thy Green Glasses out of thy Spectacles, and leave thee only thy Horn-cases to look through; by which, thou wilt be as able to read Prayers with thy Nose as with thy Eyes. Plot: Nay, if thou dost not frisk as lustily to a single Kit, whenever thy late Pupil and my present Convert bids thee, as to 24 Violins, I will Convert thy Lictorian Bundles of Birch, which Consul-like thou hast carryed before thee, into Rods for thy own Posteriors, and have no more mercy on thy Hanches, than thou usest to have on my Friend Anthony 's, when he cannot say his Lesson, though he be the greatest Dunce of the two; only his Imbecillity, varnish'd over with a Pythagorean Gravity, passes for profound Knowledge in thy Fathers Shallow Pate; where, if there is a Vacuum in Nature, there it needs must be. Anthony: By this hand, I long to open it, to try the Experiment. It's not clear to me whether (or how) Mr. Anthony's author, Roger Boyle, was related to Robert Boyle, the antagonist of Thomas Hobbes in an important controversy about the existence of vacuums and the proper conduct of scientific investigation. Anyhow, Hobbes hated Descartes, but agreed with him about vacuums. Historians of science wonder whether the ether that was loudly pushed out the front door of physics is quietly returning through the back door under the guise of “space”. Quantum field theory provides especially fertile area for such speculation. Particles are created with the help of energy present in “vacuums”. To say that vacuums have energy and energy is convertible into mass, is to deny that vacuums are empty. Many physicists revel in the discovery that vacuums are far from empty. Note that in the modern world of today, the vacuum is not inert and will interact with light and matter, if pushed hard enough. Robert and Roger were brothers, the 11th and 14th children of Richard Boyle, 1st Earl of Cork, according to Wikipedia. I realize that you're just quoting the SPE here, but I don't see how it can say that Torricelli's 1643 experiment refuted Hero's views. On the contrary, it confirmed them: the space in the tube above the mercury really is a vacuum, and is called a Torricellian vacuum to this day. There's some mercury vapor in the vacuum, but if you remove and seal the tube and freeze it (mercury freezes at about -38 degrees, C or F as you prefer), you will remove that as well. A superior vacuum was not achieved until the middle of the 19th century. [(myl) Here's what I think the argument is. Hero's theory (at least as interpreted in the 17th century) says that what causes the mercury in the barometer to rise in the tube (above the level of the surrounding mercury open to the air) is an active attempt by the fluid mercury to prevent a vacuum from existing; whereas Pascal (for example) argued that it was the pressure of the atmosphere on the mercury open to the air that pushed it up. If you read Pascal and others on the topic, they certainly thought that their experiments (e.g. Pascal's barometer-within-a-barometer) were a refutation of Hero's idea. Can somebody explain me why it is "a vacuum"? Is there any logic behind it? Not that vacuum is a countable noun. If it just another quirk of English language, any reason there is this particular quirk? Ah. The phrase being ancient explains why it always seemed at odds, well, to me, with my feeble grasp of physics, with that other obviously "younger" phrase that has nature rushing in to fill a vacuum. 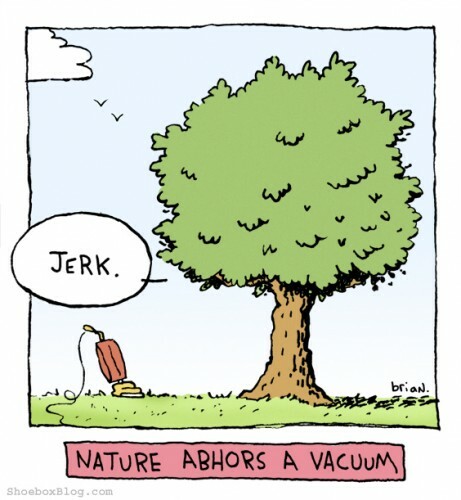 To me, that suggested nature doesn't abhor a vacuum – it adores it. Or, am I just a hopeless romantic. Sorry for irrelevant question above. Vacuum can be a countable noun as it happens. Sorry again. By the way, I have also understood "nature abhors a vacuum" to mean that living organisms will colonize any available niche, though I can't recall where I've seen it used in that sense. But this personal interpretation fits with the understanding of "nature" to mean "life on Earth, untouched by humans" instead of "the laws of physics or the physical world", which is also the interpretation seen in the Shoebox and Far Side cartoons. I read a story once that included a gunfight in a structure on the Moon. One shot pierces an outer wall. Then there is a lot of description of air hissing and things flying through the hole. The author ends the paragraph with the phrase "the dome was breached, and nature abhorred the absence of a vacuum". "Neither side appears to have tried out the recipe. If either had, then they would have discovered that freezing water expands rather than contracts"
This sort of thing always stuns me when I'm reading about proto-science. The Greeks and their Islamic acolytes discovered amazing things with astoundingly primitive equipment – the diameter of the earth being a famous example – yet the most basic empirical facts eluded them/us for thousands of years. It's understandable, I suppose – it wasn't all that easy to freeze things on demand in those days – but, still. You'd have thought someone would have left a mug of water out overnight in winter or something like that. One of the slogans cited in the 17th century documents usually called the "Rosicrucian manifestos" is "nequamquam vacuum". Other than pointing out what side of the debate the purported Rosicrucians were on, all that fact adds is the lovely sound of that Latin emphatic negative, "nequamquam . . ."
corpus, ea vacuum nequaquam constat inane. @Ginger: Presumably the Greeks et al. had at least observed that ice floats rather than sinks when placed in water. From this the conclusion that water expands when it freezes seems intuitively obvious, by which I mean I must have learned some simple principle in elementary school or junior high school which I no longer recall not knowing but which was totally unknown to the ancients. The original Eureka anecdote indicates that they eventually figured out density as weight/volume, and you'd think they could have figured out (by e.g. noting that olive oil floated on water rather than vice versa and figuring out which weighed more per amphora-full) that stuff that floats is less dense than what it floats on. Maybe they needed the notion that mass is conserved during the change of state from liquid to solid? the papal library (one of them was in pretty bad condition). 1269, and this Latin version has survived. The supposed joke is indeed a myth.